ok, ok. Listen to this. You are packing snacks for a picnic, traveling, and/or a day at the park. Have you ever tried packing applesauce? I have bought the single serving applesauces but if your son/daughter doesn't finish it all, what happens then? Do you throw the rest of it in the trash? Do you carry a container for it, or a resealable bag? Stop asking what to do. 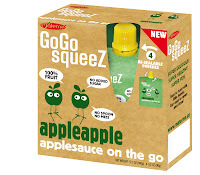 Go Go SqueeZ is applesauce made for on the go. It is resealable. It is kid-friendly. It taste good. It is 100% fruit, and no sugar. If you are like me you are wondering, is this for real? 1 pouch is equal to 1 serving. It is all natural, no artificial flavors or preservatives, gluten and dairy free, and Kosher certified. I am not an organic, health junky but in case you are, it is a brand you might consider trying. There are many flavors of GoGo squeeZ to choose from, appleapple, applebanana, applepeach, applestrawberry, and applecinnamon. My favorites were appleapple and applebanana. My son's favorites were appleapple, applecinnamon, and applepeach. Applebanana tasted like baby food to us. My son said the GoGo Squeez is like a drink. He loved it. GoGo squeeZ 4-packs are available for MSRP $2.99. GoGo squeeZ single pouches are available for MSRP 99 cents. Consumers can purchase GoGo squeeZ through Whole Foods, the natural section of supermarkets like Stop&Shop, Shaws and Jewel-Osco in select Toys ‘R Us/ Babies’ R US, and other retailers across the US. Thank you to SS | PR and GoGo squeeZ for the free samples that were provided to our family.